The two sprint freestyle relays are the only two relays at this meet where the Michigan Wolverines aren’t seeded as the number one seed, though between the 200 and 400, this shorter 200 is clearly the better of the two for the Wolverines. The names for Michigan weren’t household coming into this season, though after this week everyone will know them. Zach Turk was outstanding in Division III last year, and his progression has taken another big step forward this year under Mike Bottom. The Ortiz brothers were plucked from relative obscurity by Bottom, but are becoming two of the country’s really great, versatile sprinters a la Tom Shields; but with sophomore Bruno Ortiz as an elite breaststroker to boot. And then there’s Sean Fletcher; he’s splitting under 20 seconds swimming butterfly, so his potential in the 50 free can only be wondered at. The Wolverines have been good over-and-over again. Every time the expectation is for them to fall back to earth, they get faster again. We’re going to find out if Bottom has hit the magic formula this weekend. 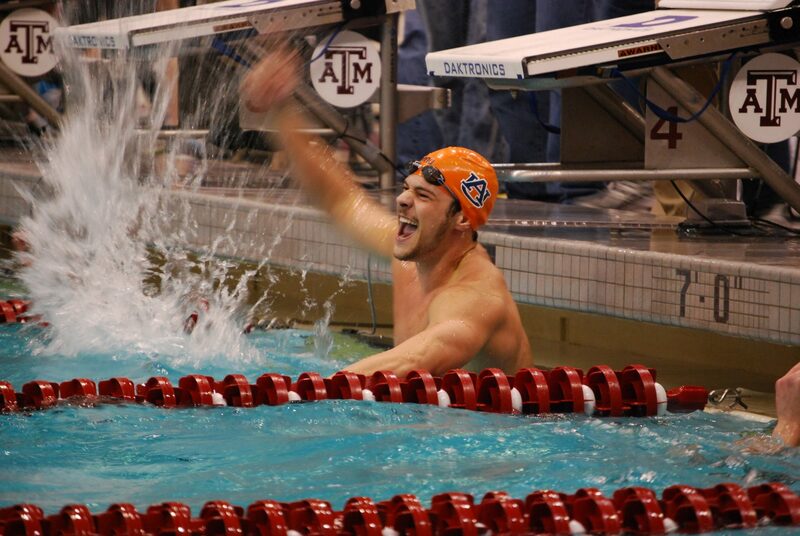 Ahead of them, though, is none-other-than the all-time kings of sprint from Auburn. They’ll lead off with Marcelo Chierighini, who is about the only swimmer in the country in the same 50 free class as Vlad Morozov from USC. If all else holds from SEC’s, next the rangy James Disney-May hits the water. Those two will be good; the back-half will be tasked to carry them home, though. TJ Leon is having a breakout junior year, and senior Kyle Owens, though primarily a backstroker, has the guts to finish any relay. Most importantly, that relay lives to win. Between Chierighini and Owens, their leadership is unparalleled, and in a race where every detail matters, that will make the Tigers tough. Florida State is the breakout program this year. They won the B-Final at NCAA’s last year, but this season they have four relays that are among the best in the country. They were really fast midseason, and really fast again at ACC’s, so they have every risk of the “multi-taper” that Michigan has, it would seem. Their bookends of Paul Murray and Mark Weber are as good of a 1-2 punch as you’ll see, with both able of splitting under 19 on a rolling start. What’s really striking about those relays is how experienced they are. Between the 12 swimmers likely to participate in the final from the top three seeded teams, 7 are seniors, 4 are juniors, and just one (Bruno Ortiz for Michigan) is a sophomore. The next few relays seeded behind them, though they certainly have veteran pieces, also have some real youth. USC, with a guy in Vlad Morozov who belongs among the Cielos, Targetts and Adrians as one of the best collegiate sprinters ever, have a monster anchor waiting. In total, they run three juniors and a freshman on this relay, with the latter being Maclin Davis. Davis, has some good experience in high-pressure environments after racing internationally in high school, so the pressure isn’t totally new to him; that’s countered with the fact that he wasn’t on the Grand Prix circuit as much as some of the other big stars were in high school. I’m not in the camp (as many are) that think Morozov’s going to split some kind of disgustingly-fast 18.1, 18.0 at NCAA’s, and expect at best maybe an 18.3 from him on a rolling start. Florida’s speed relays, much like their women’s have taken big steps forward this year. Sophomore Matt Curby and freshman Corey Main brought almost out-of-nowhere speed at SEC’s with matching 19.22 splits on the back-half of the Gators’ relay. NC State is another breakout team this season, and they have the 6th seed, but again are young with a freshman, sophomore, and two juniors. USC, Florida, NC State, and 7th-seed Cal will all return their full relays next season, and Auburn graduates only Kyle Owens (but bring in Kyle Darmody next year, who could have a huge, immediate impact). This race will be good this year, but it will be great next year. Speaking of Cal, Tyler Messerschmidt sitting out the season probably costs them a few valuable tenths, and keeps them, at least on paper, from being a top 2-3 team in this relay. Freshman Nick Dillinger, though, has come along very fast in his first year with the Golden Bears: a team confident after winning their first Pac-12 title in more than three decades. Ohio State looked fairly lethargic at Big Ten’s against the en fuego Wolverines, but a mid-season time under 1:18 shows how good they can be. Jason Schnur and Tim Phillips are a great lead pair, and the Zachs, Birnbrich and Holmes, make this a relay with four strong legs. This, maybe most importantly, is another veteran relay with three seniors. They’ve been through the ups-and-downs of the rivalry with the Wolverines, and won’t be easily thrown off. Arizona is another relay that is riding a mid-season time of just under 1:18 into this meet. They were 3rd at NCAA’s last year; though they graduated half of their third-place team from last year, getting Nimrod Shapira Bar-Or back from a red-shirt makes up a part of that. Sticking junior Giles Smith, a former National High School Record holder in the 50, into this relay instead of the 800 gives them a solid four. That probably will be the strategy at NCAA’s (it was at Pac-12’s), as Arizona has much better 200 free depth for that longer relay than they did last season. Indiana, who doesn’t have a lot of sprint-specificity on their roster this year, has assembled a pretty good 200 free relay by actually using the same four guys they have on their great medleys: Kanorr, Wells, Miller, and Ress. That’s a good job of getting the best you can out of a small core group of resources. Stanford’s relay match them in seed with a 1:17.97 from Pac-12’s, but if they’re going to use both David Nolan and Aaron Wayne on that relay at NCAA’s, they’ll want to place much higher than their 11th position coming in. There’s some other good relays further down the line that are maybe a piece-or-two short of A-Final, but if someone has a breakout meet, they’re more than capable of top 8 finishes. Teams like Purdue, or Harvard the Ivy League Champions. The team not among the top seeds that most would expect to see in the A-Final is Texas. The Longhorns were far from tapered at Big 12’s (their best time this year in the relay is actually from a meet three weeks before Big 12’s). They may not have the raw, Jimmy-Feigen, sub-19 flat starter that they had last year when this team finished 4th. Dax Hill, though, can certainly split under that mark on a relay, and with Austin Surhoff having a great sprint year, the Longhorns need to find two last legs to go 19-lows, and they could theoretically win this thing. (Eddie Reese always seems to find that last guy for a relay at NCAA’s, doesn’t he?). Tripp Cooper, John Murray, Caleb Weir, Madison Wenzler, Ben Anderson, Charlie Moore. The Horns have lots of options, it’s up to Eddie to pick the right ones. As an IU guy, it’s nice to see IU getting a little bit of cred in the 200 FR by cobbling together their top MR guys. I agree they won’t be able to get an A-Final finish. Will there be live web-streaming of the 200 Free and all the events like last summer for the Olympic Trials?